We love having awesome patients like you! We are currently accepting new patients at Witherow Orthodontics, and we’d love to provide your friends, family members and coworkers with the same great care you’ve come to know. Fill out the following information about yourself and your friend to refer them to our practice! Once your friend comes in for their first appointment, we will donate $100 to the Second Harvest Food Bank. And yes, we’ll do this for each friend you send our way – It’s that easy! 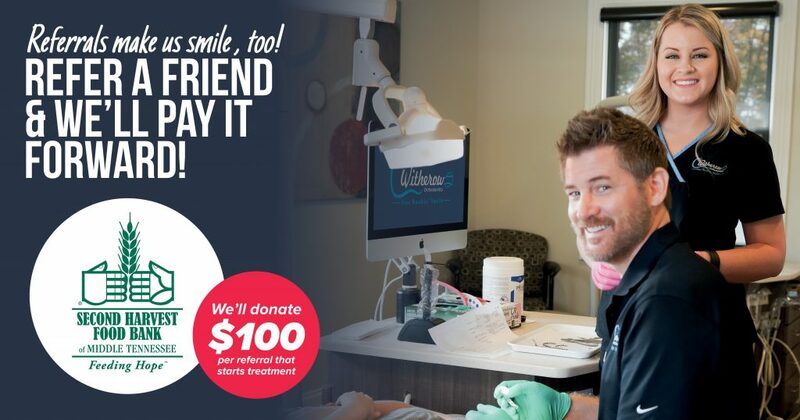 Fill out the form below to refer a friend to Witherow Orthodontics!